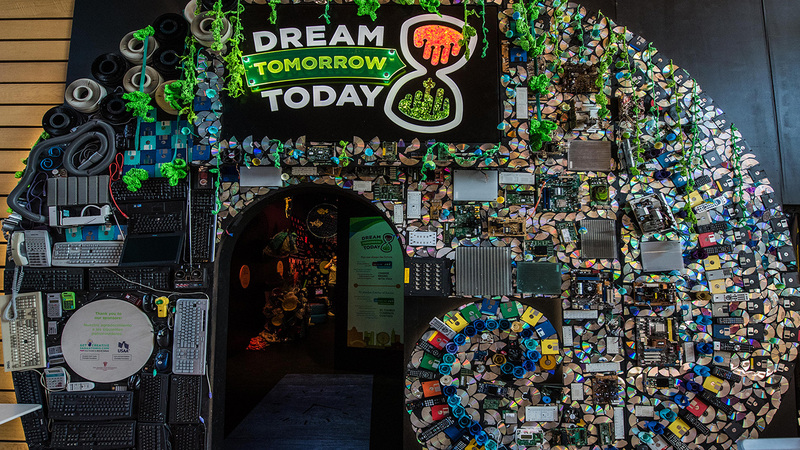 Artist, educator, advocate, and SXSW EDU 2019 speaker Calder Kamin engages a new generation of creative problem solvers by transforming trash into beautifully crafted creatures. In 2018, Kamin was selected as San Antonio’s DoSeum artist in residence and was featured on the PBS series Arts in Context in 2017. Kamin discusses her craft, the future of learning, and more as we anticipate the upcoming March event. Q. We look forward to your upcoming session “How Art Can Help Children Grasp Difficult Subjects,” at SXSW EDU 2019. Tell us why you wanted to explore this topic, and what we can anticipate discussing. A. We have to change the culture around climate change. We are paralyzed by the enormity of what we must do. It’s time to end the fear mongering, classicism and total denial of what is already happening and replace it with possibilities, especially for children. This can’t be a fight or battle against it, but rather an opportunity to rethink how we manage everything. We need to restore empathy and imagination in the conversation too. This is the power art. In 2018, I was an artist-in-residence for the DoSeum, San Antonio’s children’s museum. My residency culminated with several installations for the museum’s exhibition about the future, Dream Tomorrow Today. My goals were to I create work that was inclusive and hopeful, but also a harrowing call to action. After traveling through a time-machine made out of technological fossils from my childhood, visitors entered a space full of bright plastic, sweet music and cute animals. This place also looks like landfill. Messages from the future appear on the walls, such as “Just because you throw it away, doesn’t mean it goes away,” “Trash is the future without imagination,” “Can you imagine a second life for your stuff?” and “How can we change as we grow?” To my surprise and delight, the children enjoyed the playful and disturbing elements in my work. They understood the future depends on our choices now, that they are responsible for it too and have no shortage of ideas of about what it could look like. Understanding difficult subjects through art or art making, offers a chance to create change both internally and externally. How can we include more artful experiences when discussing heavy themes? Q. As you transform trash into beautifully crafted creatures — what materials and objects do you use when creating a piece, and are there any you particularly seek out? A. Before I made creatures from garbage, I made them in clay. A few years after undergrad, I started asking serious questions about my practice. My work was about nature, and how animals were impacted by the man-made world. I asked myself “Why am I using clay? I am literally pulling materials out of the Earth and using an abundant amount of energy to turn it into rock. Some materials are toxic, it’s heavy and it breaks. What purpose does it serve? How can my materials be part of the message?” Around the same time, I was gifted two hand-made bird feeders for my birthday. My birthday is in December, so I learned, if you feed the birds in winter they tend to stay. I became enthralled with observing them, identifying the species, calls and behaviors. Come spring, many of the birds in my yard were using rubbish to build their nests. This fascinated me. These animals were reusing the trash in the environment as raw material for their architecture. I wanted to be more like the birds. My first trash project was called the Synanthrope Station. Synanthropes are animals that thrive in the human world. Synanthrope Stations are ceramic capsules equipped with synthetic nesting supplies for urban dwelling birds. I collected litter from my neighborhood and organized it to be redistributed as building materials for avian architecture. 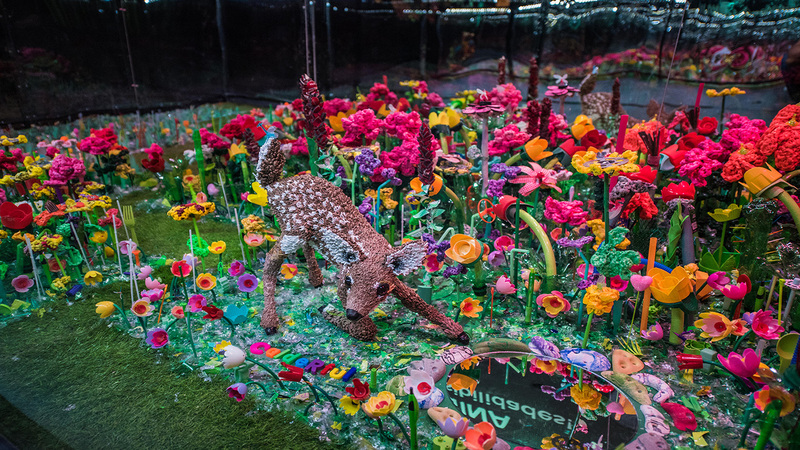 This collaboration between the artist and animal served as a testament to nature’s ability to adapt to human development and a reminder that humans still need to find creative solutions for plastic waste. This led into a deep dive in material research. Nature’s endless ability to reuse motivated me to eliminate waste and reimagine it as art. I made frogs from birth control packets to discuss the effects of synthetic estrogen on the environment, learned to cut plastic bags into yarn for crocheting from clips of little old ladies on YouTube, and then began to strip and twist the plastic bags. I would collect and manipulate them into a texture similar to fur or grass. I meticulously apply each plastic piece to build a trash eating scavenger animal sculpture. Plastic doesn’t biodegrade, it photo-degrades. UV light causes it to break down into smaller and smaller particles that are being ingested by wildlife and humans. Raccoons, foxes, rats, opossums, skunks, deer, squirrels and other trash eating wildlife became the main protagonists in my work. My series Plastic Planet was born. I’ve now learned that the process for making Plastic Planet is incredibly taxing on my body. I literally have athlete sprains from the twisting. The Austin Creative Reuse Center and the Austin Resource Recovery Center has allowed me to discover new materials and resources. New critters and plants are formed using koozies, Easter egg shells, bottle caps as well as other odds and ends discovered at the Reuse Centers, and my own trash picking, like spray paint caps collected from the grounds of the Graffiti Hope Gallery. I’m not much different from the scavenger animals I sculpt. There is a lot of playing around in my studio and this direction for my practice has brought me so much joy and many new connections. Education is also an important medium in how I deliver my ideas. I constantly ran into people telling my they didn’t know the topics covered in my art were happening to us or our planet. The materiality was a mystery they wanted to touch and explore. Now, all of my work is accompanied by educational workshops and activities that has widened my reach to thousands of school children. My work’s greater purpose is manifesting hope and possibilities for our plastic problem. I bring a second life to your stuff by turning it into a colorful and smiling creature and encourage others to do it. It’s simple, all you need are ideas, hands and a hot glue gun. Q. 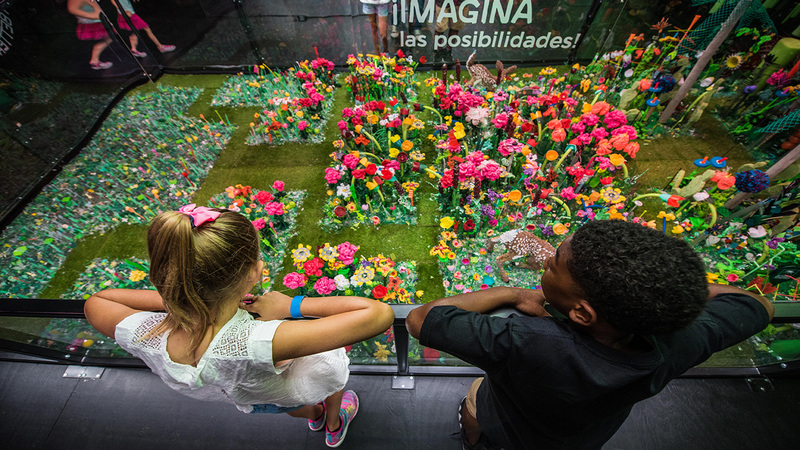 Your exhibit at San Antonio’s DoSeum is called, Dream Tomorrow Today. What do you envision the future of teaching and learning to be like? A. Younger humans have so much information at their disposal. The future classroom must be more experiential and hands-on, not about memorization or staring at screens. Including arts in the curriculum makes a break for individual expression. With our growing anxiety of the future and advanced AI on the way, creative outlets are more important than ever. We need to allow time in learning process for children’s imaginations to run wild, to prepare them for the major changes and challenges they will see in their lifetime. A creative mind is a huge asset for problem-solving. The reason I am an art loving, eco-conscious, nature enthusiast is because my early values were nurtured by my educators. That is the space where I want my art to exist. Those self-discovery moments that learning can offer. Q. What about the creative process excites you most? A. Trash is culturally considered waste, not a resource. Nature doesn’t waste, why do we? Bags were banned in Austin from 2013 until the summer of 2018. I was limited on the raw materials I could gather when I first began, which was a good thing, but it meant I had to be creative on how I reached my resources. It began with asking friends and family from around the country to mail me bags. Later friends of friends, Instagram followers and fans of a PBS special on my work sent me bags, begging to be a part of my trash transformation. With the help of my extended community, the Plastic Planet series diverted thousands of plastic bags from the environment. My work has become a community effort and with every connection, someone reconsiders their own consumption. If we all made little changes, it could create a major impact. Q. What do you hope students, and people of all ages that view your art, take away from the experience? A. The endless potential in materials, our imaginations and ourselves.